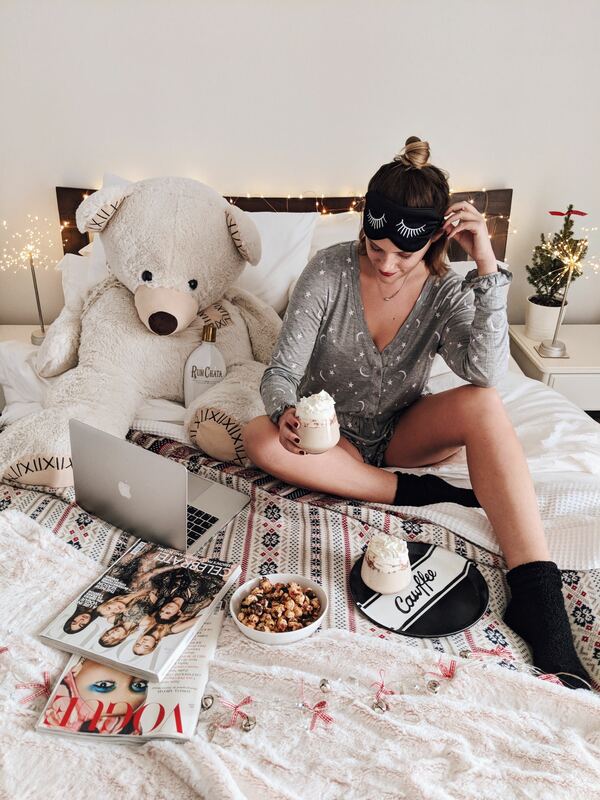 If you don’t spend the week between Christmas and New Year ONLY wearing your pyjamas, is it really the week between Christmas and New Year? Imma say no. I do not do anything between the 25th Dec and the 1st Jan. Ever. I literally just chill in my living room with my family for a whole week. My maximum level of activity is: I get up – shower – then get back into my pyjamas (sometimes a clean pair – sometimes the same ones I have been wearing for 2days) head downstairs and watch about 5 films (maybe go on a dog walk which consists on a coat and boots over my pyjamas), eat anything and everything – usually chocolate based – and then head back upstairs to bed. It is BLISS. Anyone who goes out and socialises is very brave – it’s cold and miserable out there – and there is a nice warm fire at home. And blankets. So that is where I stay. However, THIS YEAR I am completely up for organising a girls’ night in. 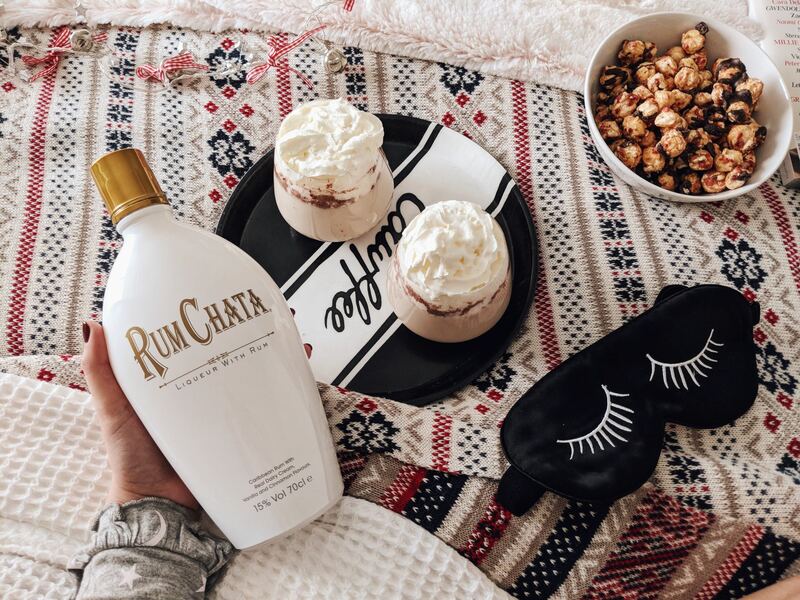 A few weeks ago, I was contacted by RumChata to see if I wanted to try and experiment with some of their recipes and obviously, I said helllll yeahhhh! RumChata is a smooth blend of Caribbean rum, sweet vanilla, cinnamon and a secret blend of other spices – so delicious! They sent me over a gorgeous white and gold bottle of RumChata (which is so instagrammable) alongside some girls night in essentials, so all I had to do was invite some of my girls over, snuggle up (obviously still in my pyjamas) sip some cocktails and watch a film – almost certainly starring Julie Andrews. 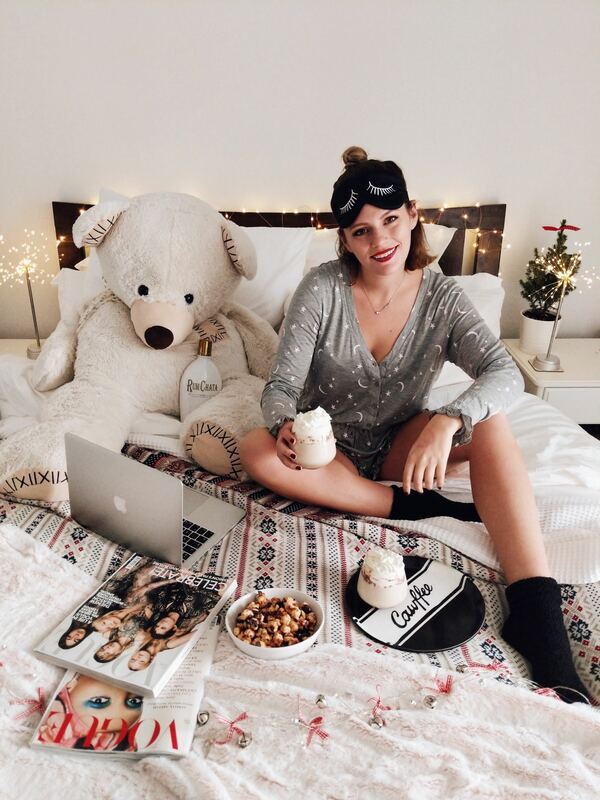 So if you fancy doing the same – here are 7 ways to NAIL a girls night in. 1. Make sure you are wearing the warmest, snuggliest, fluffiest socks. Non-negotiable. 2. Large amounts of popcorn (or snacks of any description). 3. Did I hear you say cocktails? 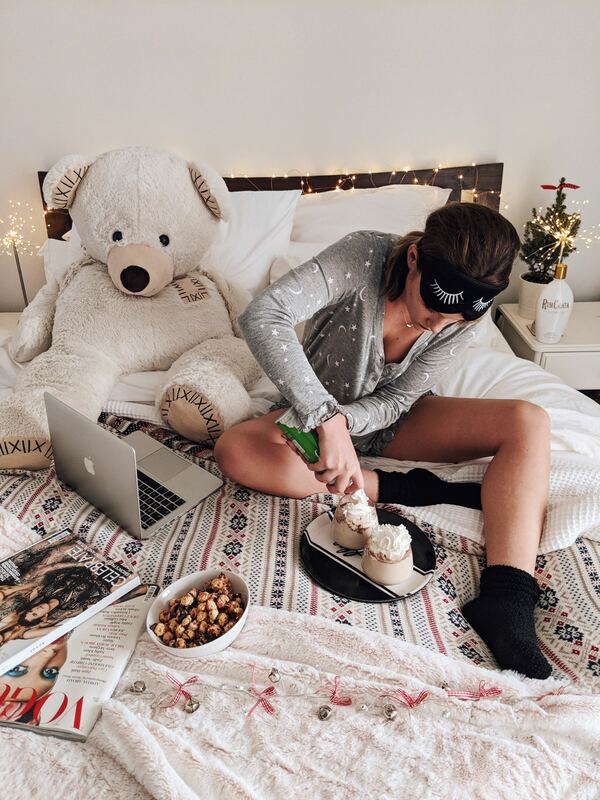 Christmas is the time to indulge, right?! This Christmas, we’re enjoying something a little different from our usual wine and G&Ts. I whipped up a batch of delicious White Russians made with RumChata – which went down an absolute treat! 1 part RumChata, 1 part vodka, 1 part coffee liqueur and 1 part cream or milk and pour over ice (I usually add a little bit more milk into mine but really not needed – I just like em creamy). Now, most civilised people would leave it at that – but I am a not civilised so I added a HUGE mountain of whipped cream on top of my cocktails. I have always done this for any Christmas cocktails – because its December and you can do whatever you want in December. Also, whipped cream is life. 4. Enough blankets for everyone so that there are no pillow fights over who gets which one. Primark has the best blankets and they are so cheap. 5. Whack a camembert in the oven (or 3) and warm up some bread for everyone to dip. DREAMY. 6. Print out your wifi code and stick it somewhere obvious so everyone feels welcome, can log on and not pester you for it once. 7. Order pizza so that everyone can eat out it out of the box – leaving no washing up for you the next day. Back to cocktails quickly – there are SO many other amazing recipes that you can do with RumChata (we spent hours on the website picking which ones to make and which ingredients to buy) as they have the scrummiest festive drinks ever. Last night, my mumma and I sampled the MochaChata which was divine (2 parts RumChata, 2 parts CHOCOLATE vodka and 1 part espresso vodka (we didn’t buy this one so we just had normal room temperature espresso shot). BUT my all time favourite has to be the RumChata Egg Nog Latte (2 parts Rumchata, 2 parts low-fat eggnog and 2 parts steaming espresso and some nutmeg). I have absolutely loved experimenting with all these different recipes and trying things I would probably never normally have tried. But mainly it has just been so fun drinking exciting cocktails rather than just sticking to red wine for our toasty evenings. I highly recommend RumChata – it is now a staple on my spirit shelf at my flat. Anyone fancy coming round for a drink? Hope everyone had an amazing Christmas – and looking forward to New Year! 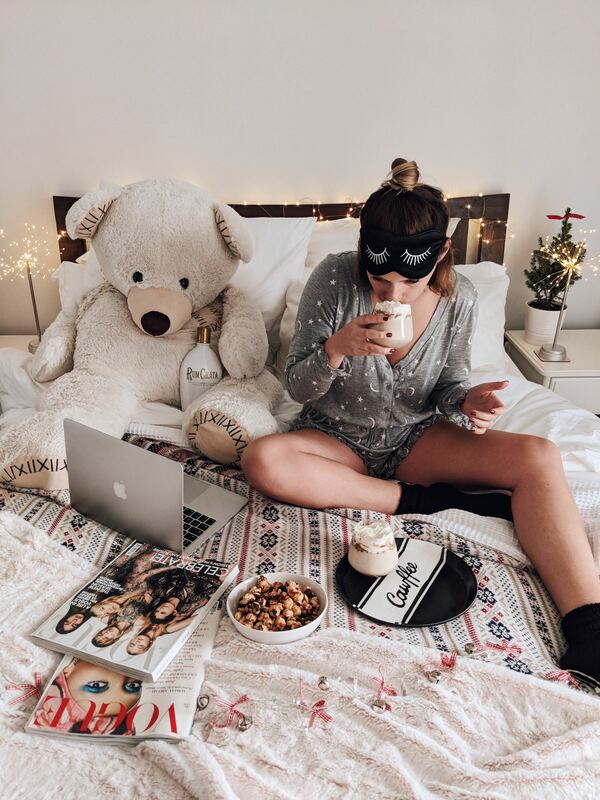 This post was written in collaboration with RumChata but all thoughts, opinions and refusal to wear anything other than pyjamas are my own. Please remember to drink responsibly.